Malt Extract: 3.3 lbs. Briess Weizen syrup, unhopped; plus 2 lbs. Laaglander pale dry, unhopped. Gravities origina gravity 1.041; terminal gravity about 1.008 The Otto Hoxxiem Deluxe Home Brewery System allows you to brew world-class beer quickly and easily at home! 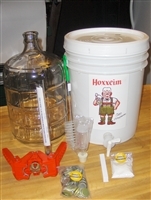 Everything you need to make a high quality beer in this simple kit. Ingredients, bottles, and fermenting barrel.